You get hungry and so will your dog so make sure that you don't pack the food away. When I travel with Niki Belle, I have a collapsible camping bowl to put water in for her that I store in the pocket on the door along with some treats. Different breeds have different conditions that may affect your travel plans. For instance, Siberian Husky dogs are beautiful creatures to look at and to own, but they can have a predisposition for autoimmune disorders. Bulldogs can develop respiratory problems as they grow up. Believe it or not, the outgoing Labrador Retriever can be one that easily develops an issue with obesity. Then you have the trustworthy German Shepherd who many people revere as one of the best breeds health wise, but this breed tends to find itself suffering from hip dysplasia. Even mixing two great breeds to end up with a dog called a Peagle, can still bring about health issues that are carried over from the two breeds that are used to create the the dog breed. As a result, before you plan your trip, make sure to take these issues into consideration so that man's best friend has as much fun as you do when you get there. Car rides can be stressful for dogs - even the ones that don't automatically get car sick. That's why when we travel long distances I make sure to have a comfortable pillow or Niki's travel bed on the back seat for her to curl up with. Not only does this help her not slide around as much, but it also has the comfortable smells that she's used to. As a result, when we step out to do something, she doesn't feel like she's being left alone. Even with this comfort though, some dogs are still going to have digestive issues and nausea problems due to the change in routine, bumpy road and other stress factors. To help combat this, make sure that you give your dog regular opportunities to exercise, relieve themselves and drink plenty of water. Additionally, avoid fatty treats and feeding them human food. If you want to take things a step further though, there are treats specifically designed to help combat these issues. One company, Canna-Pet actually makes dog treats with cannabinoids - CBD / hemp oils. Obviously though, Canna-Pet is only for dogs so don't even think about trying one yourself! However, I'm told that it is a great way to address a variety of pet health ailments including general wellness, digestion as well as epilepsy and seizures, and everything in between. While I'm seeing more and more dog friendly areas as we travel, it's always best to not assume. I like to travel with extra poop bags in the car and when I see a dispenser I typically take a few extra to restock. Dog owners tend to be very accommodating and friendly too, so always have extras in case someone needs one ... or if you see someone without one, make sure to offer it. After all, not picking up pet waste makes all of us look bad! There are a lot of hotels today that "allow dogs" and there are thankfully an increasing number that are truly dog friendly. 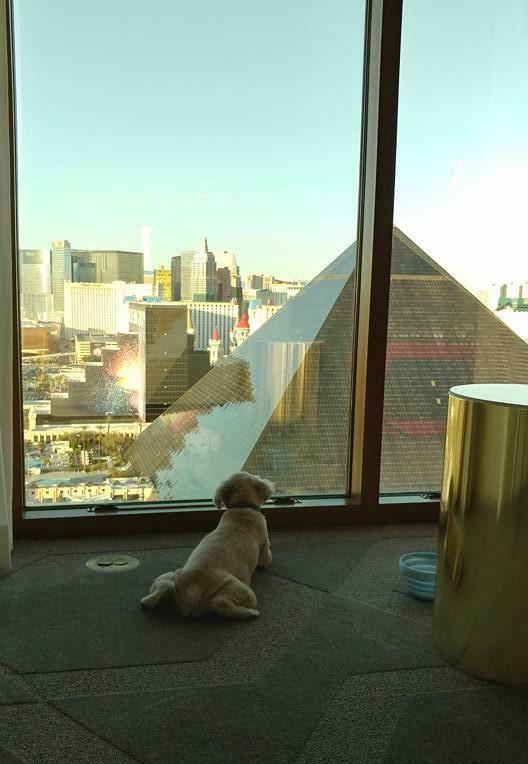 As you begin to do your research, you'll find that most cities have good options today - even Las Vegas has dog friendly hotels! Not all hotels are equal though, so be sure to check for exact policies and rates so there are no surprises.